Field: Commonwealth of Independent States (former Soviet Union) Location: Ukraine THE NEED: Tens of thousands of orphaned children live in Ukraine. Too often they are living in underfunded government institutions, in extremely crowded, unhealthy, and difficult conditions. Children who stay in these orphanages grow up disadvantaged educationally, socially, and emotionally. Many leave the orphanage, preferring instead to live on the streets. Others are forced out as teens because of overcrowding, leaving them few options for survival other than crime or prostitution. OUR WORK: In partnership with NCM, local Nazarene churches are providing ways for orphaned children to experience the love of Christ and gain opportunities for a better future. WHAT WE DO: Children Living on the Street: Many of the older children escape the confines of the orphanage to expose themselves to the dangers of living on the street. This program coordinates efforts by local churches to help children living on the street avoid the HIV and AIDS epidemic and the dangers of addiction, and to learn that someone cares about their physical and spiritual needs. Orphaned Children: Through this program local churches in Ukraine are able to minister to children remaining in orphanages who have no parents and do not know God's love for them. We coordinate efforts to provide material assistance to the orphanages and their children through the delivery of donations. We also develop and distribute Christian literature for use with children by local volunteers. Children from orphanages are included in the church’s Children and Youth Camps, and local churches promote Kids Clubs in orphanages. WHAT YOU CAN DO: This program needs financial assistance to maintain the work of a children's minister who coordinates these efforts across the country. 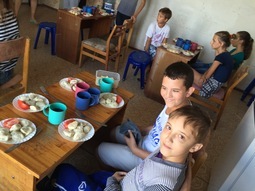 This small effort requires regular donations to help meet a recurring need of $1,000 dollars monthly for transport of materials within Ukraine and to assist local churches in start-up costs for individual projects at local orphanages. One-time donations in any amount also help to increase the scope of this project to help vulnerable children. For $25 you can help provide Kids Club for a child in an orphanage. For $50 you can help churches develop materials that teach Christian values to children. For $150 you can help send a child to a life-changing Christian camp. Be sure to put ACM1388 in the Memo area. Thanks for your donation.